The 606925 Movado Master Men’s Watch features a design which is—in a number of ways—a significant departure from many of Movado’s other watch collections. The 606925 Movado Master features automatic Swiss movement and a case of stainless steel, including black scratch-resistant sapphire crystal on the bezel surrounding an elevated series of graduated hour markers over a black dial and a black dot-pattern texture on the dial center. What sets the 606925 Movado Master Men’s Watch apart from other Movado collections—other than its utilization of a rubber wristband rather than one built of solid stainless steel, gold or tungsten carbide—is the inclusion of detailed gradation markers, linear markings on each of the hands, and black dot-textured dial center which represents the continuation of the wristband’s texture pattern. With the continuation of the wristband texture pattern represented in the center of the watch face, the architectural solid stainless steel case presents itself as an appendage which, as it would appear, could be slid up or down along the wristband. The placing of the hands on top of this feature adds a quality of illusionary mystique; while the hands are constantly held secure in their place on the dial center, the question of how would not appear obvious to discern. The 606925 Movado Master Men’s Watch consists of an architectural stainless steel case with scratch-resistant sapphire crystal and a black rubber-strap wristband for a comfortable and versatile fit. 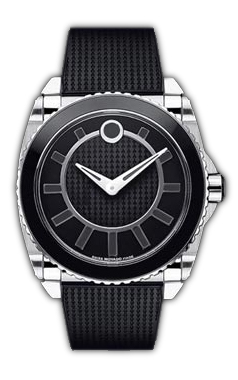 The 606925 Movado Master operates using automatic Swiss movement and has a water resistance of up to 30 meters. The 606925 Movado Master Men’s Watch retails at an MSRP of $1,600.00 and comes with a 2-Year Manufacturer’s Warranty at purchase.